[SOLVED] Naver LINE App: How To Hide Friends' Posts or Stories On Your Timeline in SECONDS? Amazon Do you use Naver LINE app on your smartphone or tablet or even PC? Naver LINE is one of the most widely used chatting apps in the world. 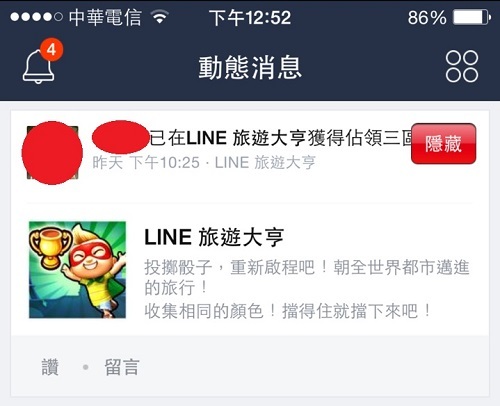 One day I was checking out my timeline and I saw a bunch of stories on LINE 旅遊大亨 which is a popular LINE game. I just don't want to see posts about LINE 旅遊大亨 or any LINE APP I so choose. How do I do that? How do you hide your friends' posts in your timeline you don't want to see? How do you make your friends' stories disappear on the timeline that you don't want to see? I just want unwanted posts invisible in my timeline. 在 Naver LINE 的動態消息裡，怎麼做才能隱藏你不想看到的朋友的 PO 文或貼文? My smartphone Naver LINE app version is 4.7.2. I am using iPhone 6 Plus. The solution is easy. Simply go to Timeline, put your finger on the post or story you do not want to see, and move your finger to the left. In other words, swipe your finger in the left direction on the Timeline story you want hidden. You will see a button "Hide". Click on that button and you will hide every story posted by this particular person. You will be able to unhide the posts of this person in LINE's settings. 到動態消息，把手指放在你不想看到的 PO 文裡，向左滑動你的手指，就會看到 "隱藏" 按鈕，按下去就對了! The bad thing is you can only hide stories posted by a person; you cannot hide posts related to a specific LINE APP. It's possible LINE will add this feature. We will see. This solution only applies to smart device version of LINE app, not the PC version.